Auburn Hills, Mich., Apr 20, 2005 - Chrysler Group is building a bigger, better HEMI badge. "By increasing the size of the HEMI badge, we're building awareness and helping our customers communicate what they're packing under the hood," said George Murphy -- Senior Vice President, Chrysler Group Marketing. "With more than 500,000 sold, the HEMI V-8 engine continues to resonate with consumers. The HEMI has become a brand within our brands. Across our Chrysler, Jeep and Dodge lineups, the take-rate for the HEMI is 44 percent." 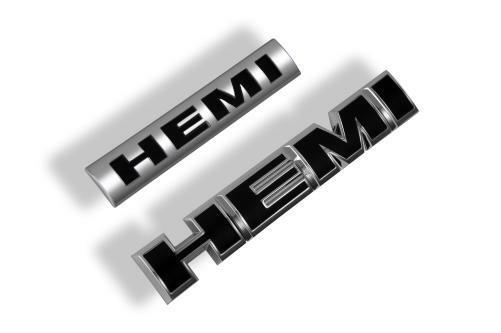 For Chrysler 300, Dodge Magnum and Jeep Grand Cherokee, the HEMI badge will increase 145 percent in size. For Dodge Ram and Durango, the size of the HEMI badge will increase 136 percent. First introduced on the Dodge Ram 2500 in 2003, Chrysler Group HEMI V-8 engine is elegantly simple. It achieves power, fuel economy and emissions goals with a design that is uncomplicated and cost effective. The versatile HEMI V-8 engine powers the Chrysler 300, Jeep Grand Cherokee, Dodge Magnum, Dodge Ram and Dodge Durango. Launching this spring, the all-new 2006 Dodge Charger will also feature the HEMI. Improving fuel economy by as much as 20 percent, Chrysler Group.s Multi-Displacement System (MDS) seamlessly alternates between smooth, high fuel economy four-cylinder mode when less power is needed, and V-8 mode when more power from the 5.7-liter HEMI engine is in demand. For 2005, MDS is available on the Chrysler 300, Dodge Magnum, Dodge Charger and Jeep Grand Cherokee.